It’s powered by an electric motor and uses an iPad to control the entertainment system, climate control and other functions. 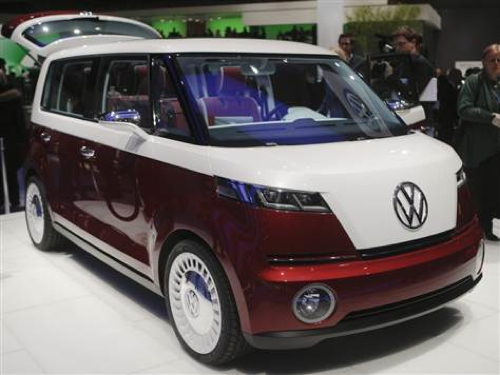 Volkswagen said the Bulli can go up to 186.4 miles on a single battery charge. That’s far, considering that the Nissan Leaf is rated at 73 miles on a charge by the U.S. Environmental Protection Agency. The Bulli can go up to 87 miles per hour. The Bulli was the brainchild of a Dutch Volkswagen importer, Ben Pon, who in 1947 sketched out a simple public bus built on the wheels of the Volkswagen Beetle. The original Bulli was made from 1950 to 1967. Other versions followed, and the vehicle was eventually sold worldwide. The concept is slightly shorter and wider than the original, with a less boxy front. But there are plenty of nods to the original, including a three-person bench seat in the front and a two-tone paint job. Volkswagen hasn’t confirmed that the concept van will go into production.